In the first blog in this series on Racketeering and Certification, we looked at actual problems in Africa (assassination of a journalist who reported on Racketeering). We then looked at the monetization of a so-called "charity" which claims to similarly expose problems -- for cash. Pay for #EarthEye / "EarthEye" and they will track your competitors, Pay for E-Steward Certification and get advance information about the same trackers. We looked at the charity's practice of sabotaging used devices (creating a problem) in order to gin up sales from paying clients (including commission-based profits, normally disqualifying for 501-c(3) "charities"). In part 4, let's look closer how this tracking works. Do Basel Action Network's services cross the line from "watchdog" and become simple extortion, or racketeering? Is the problem they purport to solve one of their own making? If a single computer monitor from this African Tech Sector shop went to Agbogbloshie days after Jim Puckett photographed it, we will bet it is the very one that Jim sabotaged. How more cringy can this "charity" get while "framing" the story? Racketeering and Certification #3: Targeted Collateral Damage!? How does Basel Action Network define Africa's Tech Sector, who purchase affordable solid state electronics for import, as a "Problem"? First, look at their words. Next, look at their claims. And we can't look away from their photos. At first glance, these are meant, like a tear-jerking Humane Society sad-dog-trick ad, to appeal to retiree church ladies or college PIRG fundraisers. That is not who funds these ads. The poor kids herding goats at African landfills do not benefit. Part II assessed BAN's service technique of selling a sabotaged (but nice looking) computer or TV with a GPS tracker inside to someone who does business with Africa or Asia's Tech Sector. Through a "Tracker" service they sell for money, you can investigate a competitor's sales. To legitimize the spy-ware (literally "ware") they try to make it about pollution and children. They send reporters, like BBC Raphael Rowe, to a dump in a city that has had TV stations and electricity for a half century, and tell the reporter it used to be a lush paradise until bad, bad African repairmen imported waste to burn on it. But usually, they just send the reporter pictures, fake stats, and halloweeny words. Racketeering often involves a conspiracy, a complicated system of money laundering, even through charities (USAToday). If the IRS investigates this NGO, through a complaint form 13909, there might be a domino effect. If billionaire corporations are privately benefiting from false claims, they could wind up at the sharp end of the Lanham Act. And million dollar settlements may ensue. Definition: RACKETEERS OFFER A DECEITFUL SERVICE TO FIX A PROBLEM THAT OTHERWISE WOULDN'T EXIST. "We don't want to have to go after you." - JP to yours truly during California Compromise negotiations in 2010. "I'm not hiding anything, and don't think much of your threats" - My response. Basel Action Network "goes after" people through the press. This week, The Guardian's environmental desk proves just how easy that is. 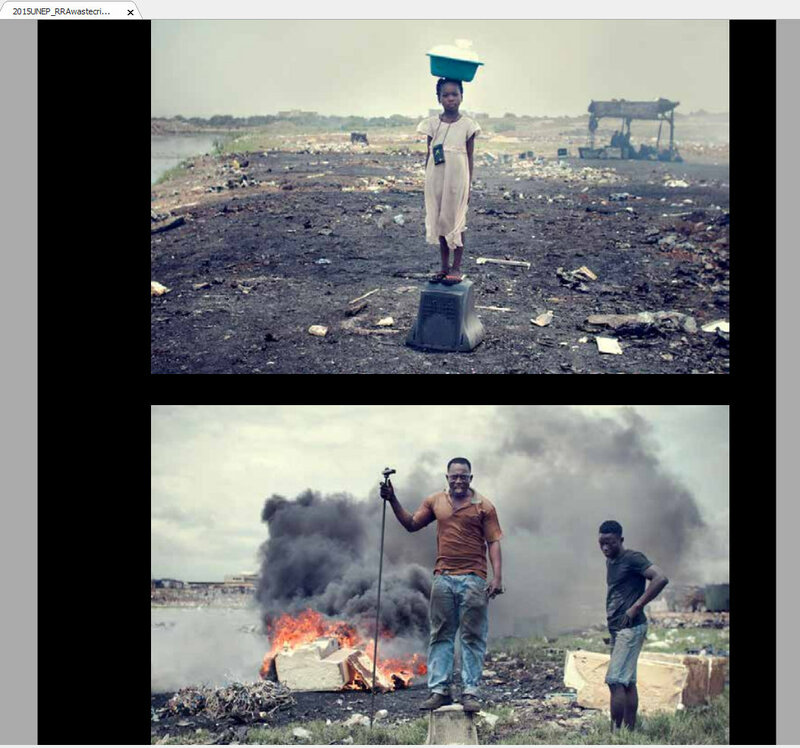 Sandra Laville's headline "UK worst offender in Europe for electronic waste exports - report" diligently puts out the hit, failing to interview a single African or Asian technician or importer. Free Joe "Hurricane" Benson, much? Mistaking Africa's Tech Sector (importers) for Africa's Scrap Sector (city wheelbarrow scrap collectors) is like mistaking a surgeon for a janitor because he's black. The only proof BAN provides is a photo of a janitor. There are several other really really simple things to find on the internet which should have given The Guardian's editors pause. I'll tick them off briefly, but stick to the point. BAN has created a problem that wouldn't otherwise exist (false reporting, sabotaged equipment, fake statistics) for the purpose of generating millions of dollars from BAN E-Stewards. BAN not only threatens companies that don't pay them, but makes examples out of those of us who defend the Geeks of Color. It is the valedictorians in the Tech Sector who suffer the worst consequences of BAN's sabotage. BAN doesn't just sabotage their equipment. It sabotages their reputation, and the reputation of anyone with the courage to trade with them, rather than boycott them. (In Part III, we'll look at who finances this sabotage).